Ladybirds are probably Britain’s best-loved insects. They are believed to be named after ‘Our Lady’ – the Virgin Mary – whose seven joys and seven sorrows are said to be depicted in our commonest native ladybird, the seven-spot. The 7-spot was also the most numerous at St Nicks until the arrival of the Harlequin. Ladybirds are members of the beetle family and some 25 different ladybird species are recognizable in the UK. Of these, eight have been recorded at St Nicholas Fields since 2010, the most abundant now being the recent arrival mentioned above. The Harlequin is an invasive species which arrived in southern England in 2004 and reached York by 2007. It is aptly named. As the photos show, it comes in various mixtures of yellow, orange, red and black. Its spots range from none to 24. Native to East Asia, the large Harlequins were introduced to North America and Europe for the biological control of aphids and spread rapidly, putting great pressure on our native ladybirds. The photos, all of which were taken at St Nicks, show seven of the eight ladybird species seen on the reserve in recent years. In addition to the Harlequin (8mm in size) and the 7-spot (7mm), we have recorded five of the smallest UK ladybirds (4mm): the red 2-spot, 10-spot and 24-spot, and the tiny yellow 14-spot and 22-spot. Next up in size at 5mm is the occasionally seen Cream-spot. 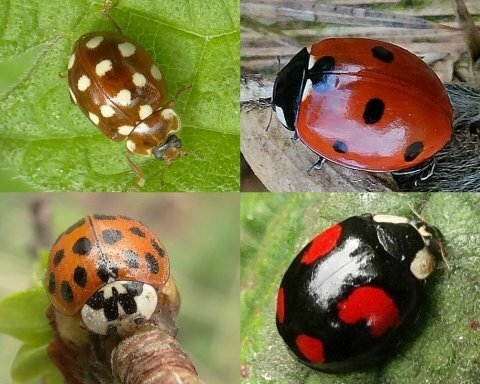 The colours and patterns of the 2-spot, 10-spot and Harlequin ladybirds are very variable, and the photos show several of the different ‘plumages’ of the Harlequins. Over 100 different forms of the 2-spot have been recorded in the UK, and more than this for the Harlequin. Other species are much more stable. A ladybird’s life has four stages: egg, larva, pupa and adult, and from egg to adult can take between 4 and 8 weeks depending on the surrounding temperature. The adults hibernate from late autumn to early spring in the leaf-litter or under logs, or in other hiding-places such as crevices in the bark of trees, and sometimes in buildings, especially Harlequins. Many perish during the winter, but those who survive emerge in March and April, feeding up to get into breeding condition. Almost all ladybirds feed (as is well known, and celebrated by gardeners and farmers) on aphids. The few exceptions include the tiny yellow 22-spot, which is a herbivore feeding mostly on mildew and algae. Ladybirds mate in late spring. The eggs, laid by the female close to clusters of aphids, take between 3 and 10 days to hatch. The larvae immediately try to find aphid prey, and over a period of 2 weeks to a month go through three moults until they are ready to pupate. The photos show the larva of a 22-spot, and a Harlequin pupa. 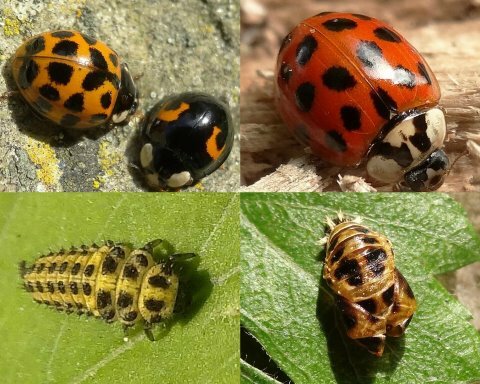 The pupal stage (in which the larval tissues break down and re-form into adult ladybirds) takes up to a fortnight, and the newly-emerged adults, often pale, soft and unspotted, need hours or even days to acquire their full colour. Ladybird populations fluctuate considerably from year to year, depending on a combination of aphid abundance, average temperature and predator pressure. In 2010 Harlequins were seen in ‘significant numbers’ at St Nicks, but in 2011 they were virtually absent. 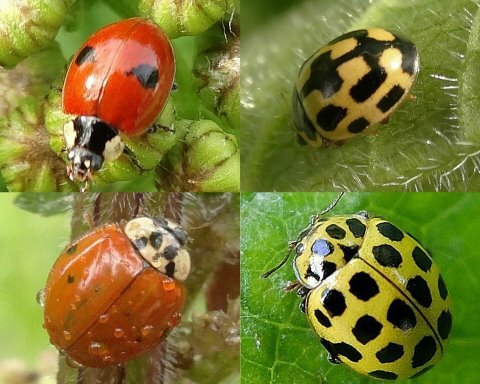 Only sporadically seen again in 2012, in 2013 they were abundant in many places on the reserve, even superabundant at the aptly-named ‘ladybird corner’ at the north-western edge of the reserve. Yet the following year, 2014, numbers had crashed. This year so far (May 2015) there have been a number of sightings, so this might be a ‘good’ year for Harlequins. The downside is that recent studies are suggesting the Harlequin is out-competing our native species for food and habitat, preying upon them, and spreading a fungal infection harmful to our native ladybirds. Seven out of eight native ladybird species have declined in numbers since the Harlequins arrived, the 2-spot by 44%. 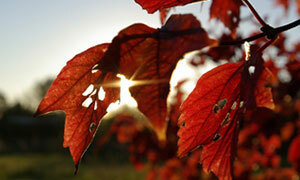 But every cloud has a silver lining: aphids beware!